Christian Petersen/Getty Images Mike Leake got the win on Thursday and then decided silence was the best policy. 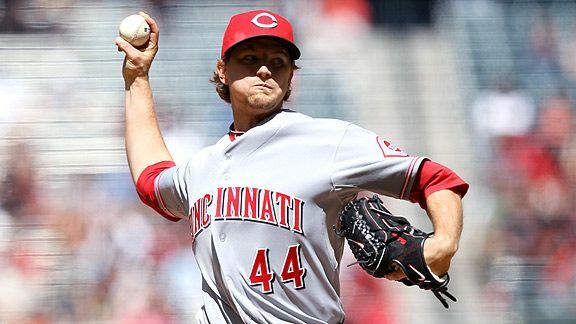 On Monday, Cincinnati Reds pitcher Mike Leake was arrested and accused of shoplifting, with employees at an area Macy's claiming he stole almost $60 in property. Naturally, Leake is innocent until proven guilty. One local report suggests the incident might have been a botched exchange of merchandise. Leake released a statement shortly after his arrest, apologizing "for this distraction." He declined to address specifics after his Thursday start. Still, even if Leake didn't do it, the crime isn't new to sports. Kansas City Chiefs linebacker Mike Vrabel recently got caught up in an incident at a casino; he called it "an unfortunate misunderstanding," and the result still is pending. Former Seton Hall coach Bobby Gonzalez was arrested and charged last July, and landed in a one-year pretrial intervention program. Countless college athletes face charges (and suspensions) for it; just search "shoplifting" in the ESPN.com archive. Even the mother of English soccer star John Terry was arrested for it -- and who can forget, outside of sports, the famous incidents involving Winona Ryder and Lindsay Lohan? "It's not too uncommon, unfortunately," said Caroline Kochman, executive director at the National Association for Shoplifting Prevention, backing that up with some alarming statistics: One in 11 people commit the crime, she said, 75 percent are adults, and one-third commit the crime habitually (more than once a month). "Shoplifting is not about the item," Kochman said, "it's about the act." Very few do it for profit -- about three percent, according to those NASP statistics. Instead, many shoplift for the thrill one feels when he or she conceals the item, walks through the door, turns around, and sees nobody chasing. Some might do it to stick it to the man, as they say, viewing shoplifting -- misguidedly, Kochman said -- as a victimless crime. Overall, regardless of the root cause, it's often a form of destructive self-nourishment -- not unlike a dieter sneaking a cookie. "They're otherwise law-abiding citizens who cross the line," Kochman said. "It doesn't fit their character in the rest of their lives. They lose their self-respect, their dignity. The loss of trust, the humiliation -- that's what the shoplifters really have to lose." Search by last name, sport or your favorites.